JailbreakMe 3.0 for iOS 4.3 Untethered Jailbreak On Its Way? The next jailbreak (demoed earlier) could be packaged in a JailbreakMe like web-based app, hints a recent conversation between Comex and a random user on Twitter. 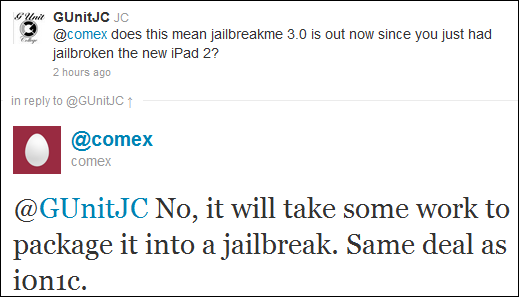 GUnitJC: @comex does this mean jailbreakme 3.0 is out now since you just had jailbroken the new iPad 2? Comex: @GUnitJC No, it will take some work to package it into a jailbreak. Same deal as i0n1c. Judging by his past releases, the jailbreak wont be out anytime soon, or at least not until Comex has ironed out all the issues and bugs before making it public. We also don’t have much details on whether the exploit used is a userland, or kernel based. If its the earlier one, then surely we can see something on the lines of version 3.0 of JailbreakMe, ready to untether all devices, including the new iPad 2 on iOS 4.3.